FTD is pleased to announce the release of “ELVIS: “HOLIDAY SEASON IN VEGAS (Hilton Hotel ’75)”. 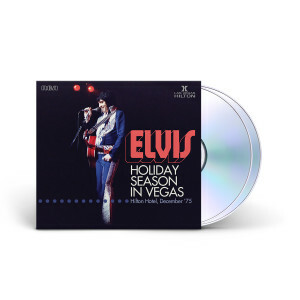 Released as a 5” digipack, this 2-CD set features Elvis in great form from the Hilton Holiday Season shows in December 1975 Las Vegas. The shows are ‘soundboard quality’ and the AUDIO has sonic imperfections. It is on the original source tape.